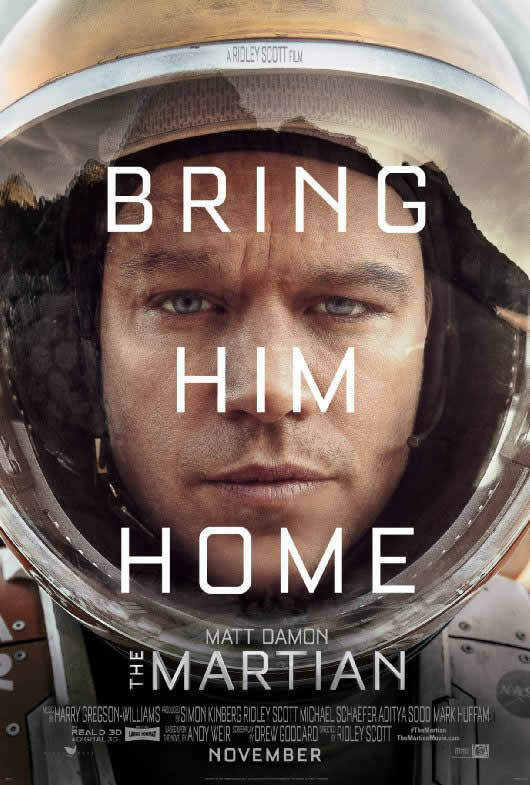 The Martian is effectively Matt Damon as Mark Watney, an astronaut who, during a manned mission to Mars, is presumed dead after a fierce storm and left behind by his crew. But Watney has survived and finds himself stranded and alone on the hostile planet. And now a second trailer has been released. With only meager supplies – having to somehow make 31 days’ worth of rations last four years until NASA can reach him, he must draw upon his ingenuity, wit and spirit to subsist and find a way to signal to Earth that he is alive. The film also stars Kate Mara, Jessica Chastain, Kristen Wiig, Mackenzie Davis, Sean Bean, Sebastian Stan, Donald Glover, Jeff Daniels, Michael Peña, Chiwetel Ejiofor, plus Headhunters‘ Aksel Hennie and Jonathan Aris from BBC2’s The Game. Directed by Ridley Scott, from a screenplay by Drew Goddard, based on the book by Andy Weir, I loved Scott’s last venture into space for Prometheus in 2012, which looked outstanding in IMAX 3D.